The people that live in the house did not earn the house, but were loaned the property from the true owners, the taxpayers. Because of this, the residents do not have the “pride of ownership” that comes with the hard work necessary. In fact, the opposite happens and the residents resent their benefactors because the very house is a constant reminder that they themselves did not earn the right to live in the house. They do not appreciate the value of the property and see no need to maintain or respect it in any way. The result is the same whether you are talking about a studio apartment or a magnificent mansion full of priceless antiques. If the people who live there do not feel they earned the privilege, they will make this known through their actions. 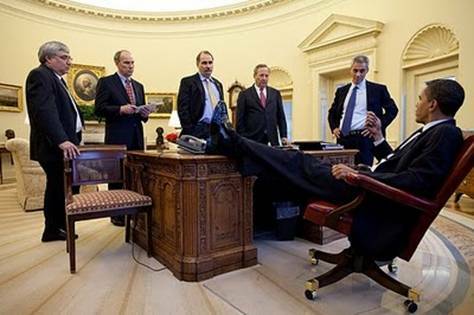 Mr. Obama, with all due respect, get your feet off our desk! Ronald Reagan had so much respect for the Oval Office that he never entered it without a jacket and a tie. He never put his feet on the desk. Posted in Barack Obama and tagged Democrat, Desk, Disrespect, Election, Obama, Reagan, United States, White House.